Face to face with ‘Peace Studies’ students …re-writing our history in broad daylight! 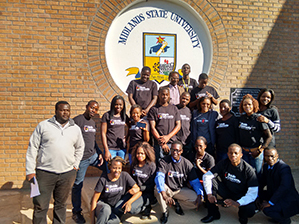 LAST Friday, the Zimbabwe Heritage Trust (ZHT) was invited to Midlands State University (MSU) to give a lecture on regime change through education to students doing Politics and ‘Peace Studies’. The invitation was prompted by several critical articles we had run in The Patriot about the hidden purpose of the ‘Peace Studies’ programme recently introduced at universities across the country sometimes as a compulsory course. There was visible discomfort at the beginning, as we were introduced to each other, but that was inevitable. Some things we do are so blatantly anti-nationalistic and anti-Zimbabwe even if one uses ZANU PF’s mistakes as justification, everyone can see we have crossed the red line to the side of our former colonisers and that is an act of betrayal. As we shook hands, we all saw it. That is why there was a bit of tension at the beginning. Cde Pritchard Zhou, the CEO of ZHT made the presentation. The history of the black man was a series of catastrophes engineered by the whiteman in his bid to use the black man as a resource to enrich himself. For example, during slavery, millions of blacks were shipped across the Atlantic from Africa to work in the whiteman’s sugar, banana and cotton plantations in the Caribbean and Americas. In the process, the whiteman worked to change his mind to accept his circumstances as inevitable. Machinery invented during the Industrial Revolution replaced slave labour and killed the slave trade not a British philanthropist called William Wilberforce, as we were taught at school those days. And then the decolonisation process which was in most cases violent, followed by neo-colonisation. And in each historical epoch, the whiteman devised more sophisticated ways to continue exploiting the black man and his resources. So that today, after ZANU PF’s landslide victory during the 2013 general elections, British foreign policy strategists at Chatham House, have identified education as the remaining window to continue influencing events in Zimbabwe. It was during the question and answer session that alarming misconceptions emerged. A student rose to raise a point of correction; that it was erroneous to say independence was brought by force. It was negotiated and granted by the British at the Lancaster House Conference. Another student charged Africa had contributed virtually nothing to the development of the world, not even to ‘re-invent the wheel’ that the whiteman invented centuries ago! A third student, the one moderating the presentation, kept reminding everyone not to mix politics with the discussion because the discussion had nothing to do with politics. We were speechless and powerless. Hardly 30 years after a brutal and bloody war that claimed the lives of over 50 000 people, that defining experience, the Second Chimurenga, was being downgraded and pushed over the edge in front of our eyes. By raising the profile of the Lancaster House Conference to eclipse the liberation war, the objective is to eventually credit our independence to the sterling effort of the British who convened that conference. Reading through the pages of the booklets for ‘Peace Studies’, one quickly notices the strenuous effort to obliterate the war for independence from the nation’s memory. It is not farfetched to believe the programme wants to create a new reality that does not include the war for independence, a reality that ascribes our freedom to the goodwill of the British. I was part of the platoon that went to Nyadzonia immediately after the Rhodesian Security Forces attacked the camp in 1976. Before we got to the camp, we began to stumble on the dead. The camp was an undulating sea of dead people you thought they were sleeping, hundreds and hundreds of them. And then we began searching for the survivors. We buried the dead in pits they had intended to use as latrines. By the third day, their skins peeled in our bare hands and everywhere we went, we carried the horrible smell of rotting corpses. In the end, we didn’t speak to each other anymore, just buried the dead in silence. For me, the most enduring image was the little girl sitting against a tree, with a gaping machine gun hole through the chest and her small heart showing. The blood around the chest had clotted and dried. I could not understand how she had not died a long time ago. “Will I survive?”she asked calmly. My heart tore apart and I looked the other way. I cried, trying to come to terms with the anguish of the war. When I eventually turned, the little girl had died. And 30 years later, at MSU’s newly opened campus in Zvishavane, one student believed we got our independence through the benevolence of the British and another believed Africa did not contribute anything towards the development of mankind. Africa’s contribution towards the development of the human race is unquantifiable. Evidence of the first man, homo sapiens, and the primitive tools that he used to survive, were found in the East African Rift Valley. Therefore civilisation began in Africa. Writing was invented in Egypt. The first university was in Timbuktu in Mali. Our own Monomotapa ruled over a civilisation and kingdom that stretched from the Indian to the Atlantic Ocean. His capital city was at the Great Zimbabwe. When Cecil John Rhodes saw the complex architectural design of the Great Zimbabwe, he wrenched their construction from us and gave it to the Portuguese. Before 1980, we learned at school that the Great Zimbabwe was built by the Portuguese or the Phoenicians, anyone else not us. There is overwhelming evidence that the Garden of Eden was in Ethiopia. Therefore even if one chooses the theory of creation, Adam and Eve were created in Africa. Africa is the cradle of civilisation. Anyone who says a programme like ‘Peace Studies’ can be apolitical is being dishonest. It is like saying the security services sector can be apolitical. Where in the world do you find an apolitical soldier? A soldier who is not political is a mercenary or a bandit. Our own Zimbabwe Defence Forces and Police were born out the liberation struggle and are there to defend the liberation war agenda. There cannot be any confusion about that. If we don’t intervene in the design of the curriculum in our education system now, the reality is that in another 20 years, the official account of our story will be that we owe our independence to the goodwill of the British. Signs of that frightening reality were there at MSU. The Lancaster House Conference was not an ingenious idea that the British came up with to solve Rhodesia’s political crisis. The conference was a result of the conditions created by the brutal war that we were fighting. That is where our independence came from, the war. And then as we said our goodbyes at the end of the presentation, the ice had melted. Everyone, especially the students, wanted us to return for another session. We had given them strength and courage to clean their savaged identity. We had brought them knowledge that they related to, knowledge that made them heroes, knowledge that made them masters of their destiny. And then we asked: where were the ministries of education in the face of all this? Next articleWhere is the ZANU PF Leadership Code?